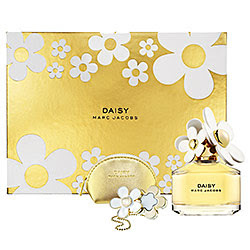 Marc Jacobs Daisy, oh how I love thee. Let me count the ways. 1) You smell utterly and unbelievably fantastic. 2) You are housed in one of the cutest bottles I've ever seen. 3) You last for hours and you never become too close or cloying. 4) You keep coming up with new and interesting ways to draw me in, like with this new Gift Set. No matter how you slice it, Marc Jacobs Daisy is one of my true faves. And this Gift Set is definitely one of the most fab things I've seen in quite some time. And why, might you ask? Because not only does it include a 1.7oz Eau de Toilette Spray, but a Solid Perfume Ring comes along for the ride. The fragrance itself is delightfully warm. Fruity notes of strawberry and ruby red grapefruit combine with floral notes of violet leaves, gardenia, violet and jasmine petals, topped off with rich notes of musk, vanilla and white woods. What this results in is a deep, intensely lovely scent that stays on the skin for hours yet never makes you feel like it's too close or strong. Best of all, this set retails for $60 on sephora.com. Totally a bargain in the eyes of this daisy lover!